If you like biking and island hopping the beautiful Shimanami Kaido path across Japan’s Inland Sea is a spectacular ride. 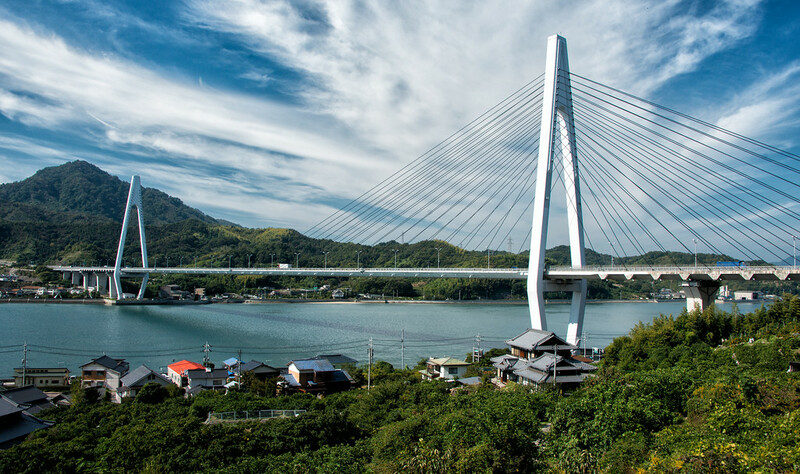 The path wanders across six small islands and seven bridges taking riders between two of Japan’s major islands, Honshu and Shikoku, and can be done in a day. The path is safe, well marked, and mostly flat as it follows city streets along lovely coastlines with views of the sea, small islands, and Japanese villages. There are some steep sections leading up to the bridges between the islands, but then you can have fun coasting down the other side. It’s easy and is about $5 to rent a bike for the day (in 2014) in Onomichi where the path starts. And there are many stopping points along the 60 km path to Imabari where you can return the bike and catch a bus back to Onomichi. The final section, after crossing the amazing Kurushima Bridge, the world’s longest suspension bridge, on the way to the Imabari train station, is mostly crowded city streets so I recommend returning your bike just after crossing the bridge and catching the bus back to Onomichi. 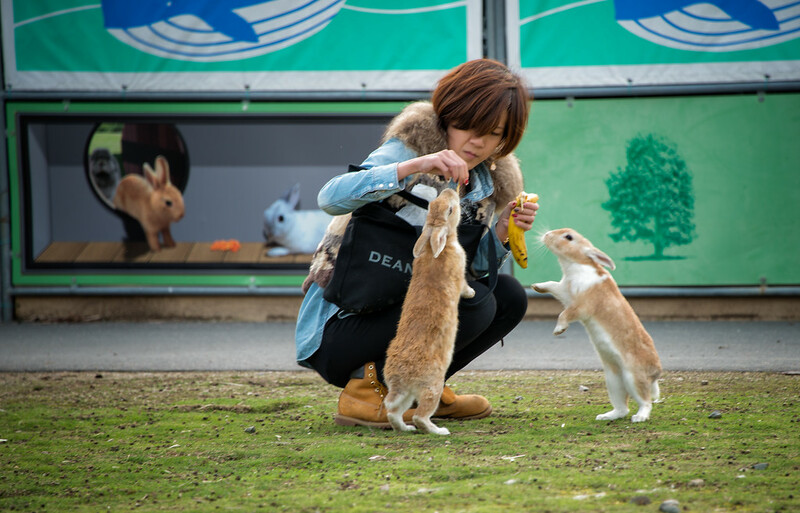 If you have some extra time you can take a detour to Okunoshima, aka Rabbit Island. It’s a small island, you can bike around it in about an hour, and it’s famous for having hundreds of friendly wild rabbits. Rabbits everywhere! It’s so much fun! But be careful, they’ll eat everything. One of them chewed through my backpack when I wasn’t looking. But she was so cute that I didn’t mind. 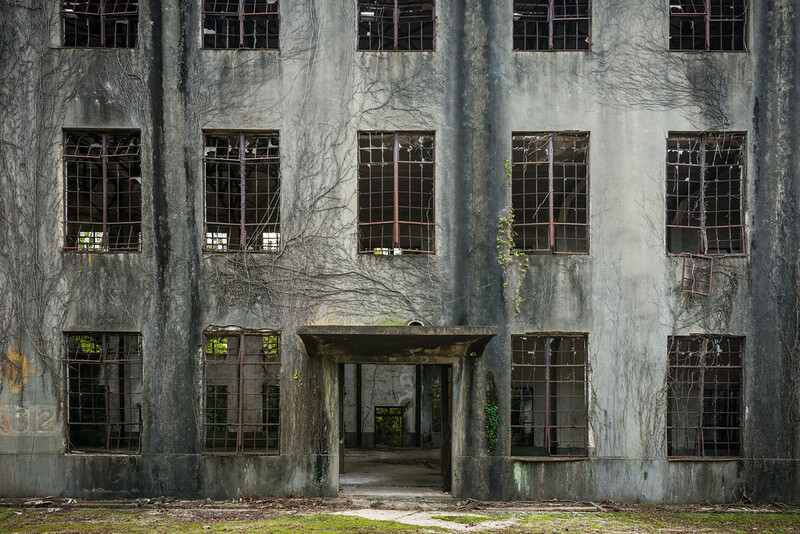 During WWII Okunoshima was a chemical weapons depot and as you bike around the island you can see overgrown buildings from that time. 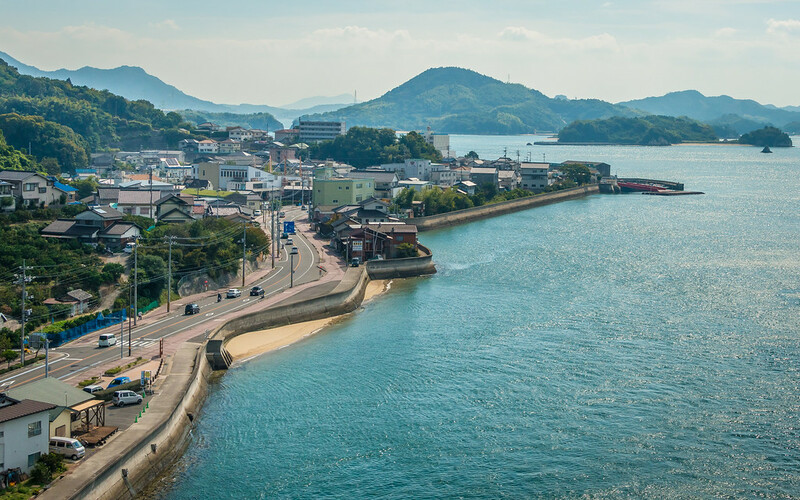 Note that bicycles aren’t allowed on most Japanese trains so don’t try to take a short cut back to Onomichi by taking the ferry to the train station at Tadano-Umi. With easy to rent and return bikes, a well marked path, and pretty scenery the ride across Japan’s Inland Sea between Honshu and Shikoku was one of the highlights of my time in Japan. And the detour to Rabbit Island made it even more unforgettable. To get to Onomichi you can take a five hour Shinkansen ride from Tokyo to Shin-Onomichi station, or a one hour ride from Hiroshima. From Shin-Onomichi is should be easy to find a taxi to a hotel in Onomichi for the night so you can start in the morning. During your bike ride you can take a detour to Okunoshima by taking a ferry from Sakari on the North-East corner of Omishima. But if you take this detour there almost certainly won’t be enough time to finish the bike ride to Imabari. 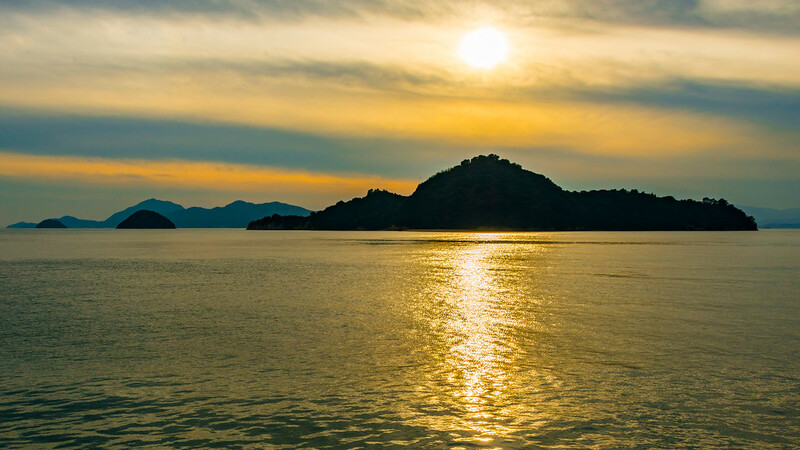 One option is to prebook a room at Okunoshima’s only hotel, Holiday Village, spend the night there, and do the second half of the bike ride the next morning. 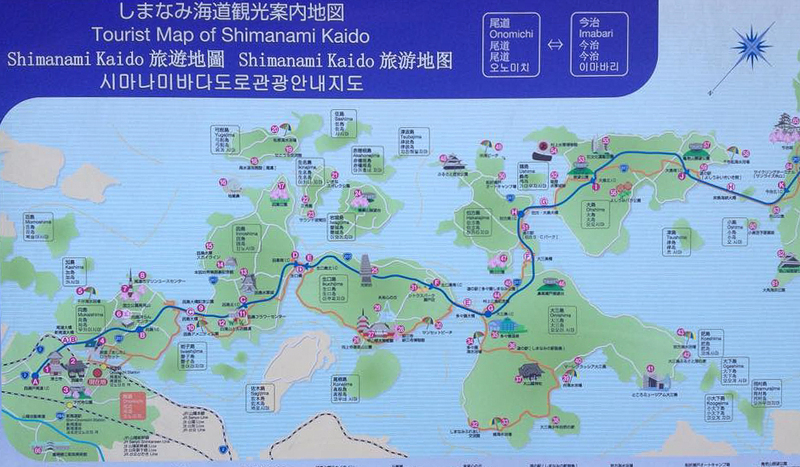 Another option is to visit Rabbit Island separately from the bike ride by catching a train from Onomichi to Tadano-Umi then catching the ferry from there directly to Okunoshima. It’s easy to visit Rabbit Island as a day trip from Onomichi via Tadano-Umi. Google is great for directions around Japan. For the ferry to Okunoshima I recommend Googling “tadanoumi ferry schedule”. Thank you for this. I would never have thought of biking in Japan, but now it goes into the Japan file for a future adventure. We also cycled the Shimanami Kaido, it was an amazing experience to see this part of Japan by bike and meeting people from all over the world doing the same route. We took our time though and did the whole way, including the islands over 1 week. Sounds nice to do it more slowly! It’s great to hear from someone else who did it. Thanks for writing.